Home Secretary Theresa May today indicated that, in the coming weeks or months, the Government will formally exercise its right to opt out of around 130 EU crime and policing laws. The list of laws subject to the block opt-out includes several contentious measures such as the European Arrest Warrant, those establishing the EU’s judicial and policing agencies Eurojust and Europol, and databases to share criminal records and DNA between member states. The opt out must be taken en bloc: either the UK opts out of all EU crime and policing measures on the list or it must continue to accept all of them and, from December 2014, the European Court of Justice (ECJ) will have full jurisdiction over them for the first time. So, it is important to remember that this is not simply a choice between the status quo and opting out, but between opting out and granting EU judges the final say over how this body of around 130 laws is applied in the UK. 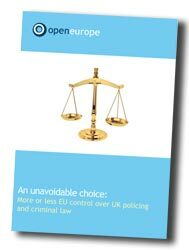 This year, in An unavoidable choice, Open Europe recommended that the Government take the opt-out as soon as possible, in order to start the process of reconfiguring the UK’s cooperation with other EU member states in the field of crime and policing. Subject to successful negotiations and with adequate checks and balances in place, the UK could then choose to opt back into individual measures considered to be absolutely vital. The UK Government has committed to a vote in both Houses of Parliament on whether the UK should take the block opt-out. Given that over 100 Conservative MPs have already signed a letter in favour of exercising the opt-out and backing Open Europe's report, it would be virtually impossible for David Cameron to get a decision to opt in through Parliament without either the biggest rebellion to date or it being struck down, should Labour also decide to vote against the Government. The UK retains the right to apply to the EU institutions to opt back into individual measures that it considers to be in the national interest. The UK is likely to want to continue to cooperate in the EU’s criminal databases and perhaps a reformed European Arrest Warrant that contains greater safeguards for individuals facing extradition. Therefore, today’s announcement kicks off a process of negotiation both between the Coalition parties and between the UK and the EU institutions over what the UK opts back into. If the UK opts back in, this is irreversible and the full powers of the ECJ apply. It is this issue, the potential role of EU judges, which it is vital to consider. The ECJ has a record of interpreting EU laws which centralise power at the EU level and in ways in which national governments do not expect or agree with. In other policy areas this has included banning insurers’ distinction between male and female drivers to price insurance premiums, for example. Once these rulings are made, the EU’s ‘democratic deficit’ really kicks in because overturning such a ruling usually requires a qualified majority of member states and the agreement of the European Parliament. Accepting ECJ jurisdiction is therefore a huge gamble that could backfire on the UK’s justice system. The UK could, in theory, be refused ‘re-entry’ once it has opted out en bloc. This could happen if, for example, individual opt-ins became subject to conditions from the European Commission or entangled in negotiations over other, unrelated areas of EU policy and the UK needed to horse-trade over an opt-in. The European Commission has pointed that the UK could be faced with a bill for the “direct financial consequences” of the mass opt-out, although there is a degree of scaremongering involved as the cost is not likely to be overly large and, more importantly, it would be a huge own goal for other countries to be seen to put a disproportionate price on democratic choice and debate. In addition, those that fear the UK’s loss of influence ignore the strength of the hand that the Government has in negotiations to opt back in. The UK is a big destination for other member states’ nationals, Britain receives the biggest number of EU extradition requests and the EU treaties state that the UK and the EU institutions, which in the majority of cases will be the European Commission, “shall seek to re-establish the widest possible measure of participation” in crime and policing. We also should not forget that the opt-out was negotiated with the other member states by the previous British Government, precisely because it was concerned about the power the ECJ would have over this area of EU law. These concerns remain and, ultimately, the decision over the 2014 block opt-out is a matter of balancing operational expediency against national control and democracy. The current level of integration in this hugely sensitive area has so far been subjected to a worrying lack of democratic debate in the UK, as it has tended to occur in a piecemeal fashion and outside the glare of media scrutiny. Politicians, the policing and security community and civil society now have the opportunity to debate the issues properly for the first time. This debate will enhance the democratic legitimacy of whatever is agreed and should therefore be welcomed by all involved. 3) And, most importantly of all, that the decision is in the best interests of British citizens and not the Coalition. The crucial phrase is "subject to successful negotiation". Why will our partners wish to accomodate us to any significant degree? Why should we suppose our individual strength can match their collective strength? Let's leave it to 'Cast Iron Pledge' Cameron: we know how far he can be trusted.